Whether all your jewelry is new or you have mostly vintage rings, necklaces, bracelets, and earrings, you’re going to want to know how to clean your possessions every once in awhile. Ultimately, how you clean your jewelry will depend on what it is made of (gold, silver, pearls, diamonds). Many stores offer a free cleaning of jewelry that you purchased from them. By all mean, take advantage of this service if you can, but if you can’t, then you should know how to clean your jewelry at home—and without harsh chemicals. To bring the shine back to your gold jewelry, fill a bowl with warm water and add just a few drops of mild dish soap. Submerge your gold jewelry and let it soak for 10 to 15 minutes. Then rinse and gently scrub away any grime or residue with a soft-bristled toothbrush. Finally, dry with a soft cloth. Don’t use a paper towel because it might scratch. Depending on how much gold jewelry you have, you can use a small bowl and work in batches or use a large bowl and clean everything all at once. , but if you want to use a less harsh method, try a little toothpaste to remove the tarnish from your silver. Just dab some toothpaste onto your silver item, rub it in, and watch the tarnish disappear. Wipe the toothpaste off with a cloth. The toothpaste method works best with a ring or bangle bracelet or even a belt buckle. After a few minutes, remove each piece individually. Be careful of the hot water. Rinse and dry each piece with a soft cloth, and you’re done. To make your diamonds sparkle again, you can use a few drops of mild dish soap in a bowl of warm water. Soak for a couple of minutes and then use a clean soft-bristled toothbrush to get stuck-on dirt or grease. Rinse and dry with a soft cloth. Be careful around the settings. Don’t brush so hard that you loosen the diamond or damage the prongs. If you find your diamond is particularly grimy, try cleaning every few weeks so the dirt doesn’t build up too much. These types of stones absorb liquids, so you don’t want to soak them. 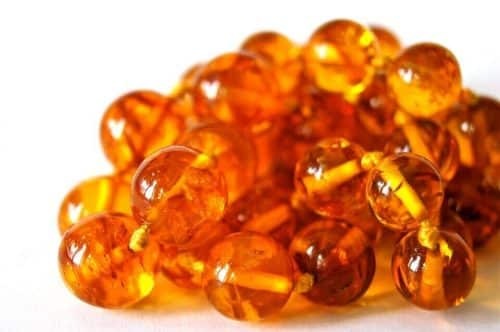 Simply dip them in a bowl with lukewarm water and a few drops of gentle soap. Rinse off any residue and gently rub dry. If you have a string of pearls or other porous stones, be careful that you don’t damage the knotting or stretch them by pulling or handling them too roughly. Try drying them them flat on a cloth. to brighten up your jewelry between cleanings. They are easily available and not very expensive. After cleaning—and when you’re not wearing it—make sure you put your jewelry away in a dust proof box. Protect your pearls by storing them in tissue paper. That way you’ll always have clean and sparkly jewelry at the ready. Since jewelry is exposed to make up, hair spray, and other residue-producing elements, it will always need a some cleaning. 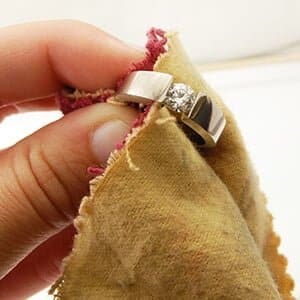 If you stick to a regular schedule of cleaning and polishing, and you store it away properly when you’re not wearing it, you will be able to enjoy your jewelry whenever you want without too much muss and fuss. Leona J. Celis is a freelance writer and a professional jewelry appraiser from Los Angeles, California. With over 10 years of experience in the jewelry industry, she has worked with many different clients whose needs ranged from jewelry appraisal to gemstone repair and ring sales.